Bad Boy Cooks. Motormouth Eats. For only RM13/USD4 per portion, don’t expect perfectly grilled Angus steaks. At Bad Boy Cooks; the theme is real food, fresh from the kitchen, no frills. I first visited Oasis Square a year or so ago, having lunch at a place called Crave Cafe. The food was nonetheless .. forgettable for as much as I can recall. The reason we walked in was because the crowd was relatively thinner compared to Mr & Ms Cafe that does better all day breakfasts, desserts and well, gimmicky props for camwhoring/selfie sessions. If you have not even heard of Oasis Square, and the name sounded as far-fetched as one in the middle of a desert, then you obviously don’t pay enough attention to this up and coming business district at Oasis Ara Damansara. Situated off Subang airport road near to Citta Mall, the entire area has been livened up significantly with big names like Royal Flush Restaurant, Kumar’s Curry Fish Head, Rakuzen and Crazy Crabs. 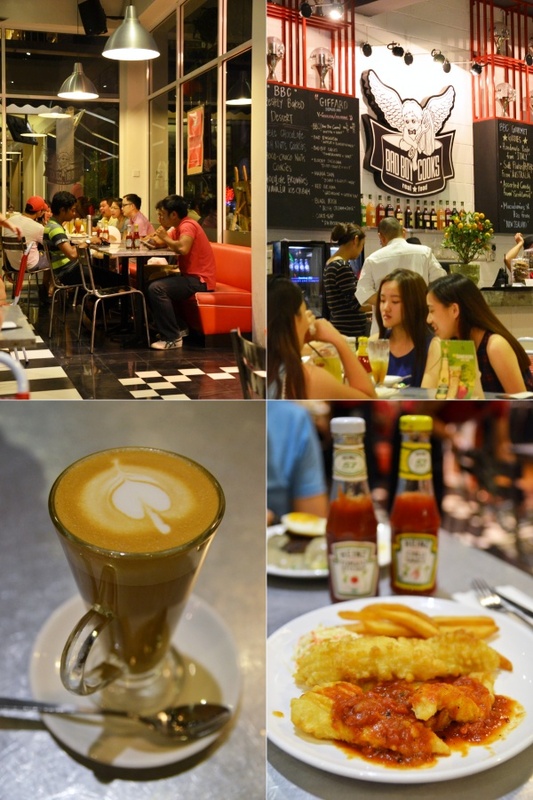 A bit wary of falling into the same overpriced, mediocre food trap, we set our eyes on Bad Boy Cooks; an American diner style that’s a made in Malaysia brand. And meals costing less than RM20/USD7 per pax including drinks? Game on. Bonus of a bright, cheery environment, competitively priced food and drinks and relatively quick service. The diner like environment – checkered floors, blood red sofas and metal table tops was a welcoming sight; almost fast food environment but with detailed, one piece laminated menus served to you at your table. A quick glance had me sat up and paid attention. Most items go for around the RM10 mark; even mains like grilled chicken, fish, and beef. Pastas, rice bowls and salads are even priced slightly lesser, to which I started wonder if everything’s relegated to an appetiser size. Doubts in mind, but comforting to see neighbouring tables (the place was packed that evening) happily chomping down platefuls of pastas with succulent grilled chicken and some tucking in into their aesthetically-sterling beef burgers. Thus, we sampled two items from the list; the Tempura Fish (RM10/USD3.30) and Beef Patty with Egg (RM13/USD4). You can choose your sauce (brown sauce, pomodoro or black pepper) to go along with your meat, and for an additional RM1/USD0.30, you get a choice of an iced drink! (either green tea, lime juice and something else). I had a hot latte for RM5/USD1.60; cheaper than any cafes in Ipoh even! Though the food was not of exceptional quality, the taste was not half bad either. Definitely a cut above the average fast food places; with fresh ingredients and cooked to your orders. The fish in particular; was dory alright but coated in a light batter then deep fried before served with a generous ladle of tomato-based pomodoro sauce; was delicious. The fries came a bit harder than crisp level though, but forgivable. The second visit had us sampling the Grilled Cajun Chicken, side bowl of Chili Beef and Grilled Dory. Though they could have done better with the chilli beef, the grilled dory was a wee bit bland. Or maybe I was still recovering from the food poisoning spell. TGIF in a few hours’ time. Have you got your eating spree planned this weekend? Or are you escaping the heatwave by hibernating underneath a well-ventilated, air-conditioned shopping mall around Klang Valley? For most recent information you have to go to see world-wide-web and on world-wide-web I found this site as a most excellent site for most up-to-date updates.